One of Tresillian’s 2 defibrillator units is located on the A390 to the right of Mary’s Pasty shop, affixed to Graham & Kay Ellis’ exterior wall, immediately adjacent to the St Clement Parish Council/Tresillian Village noticeboard (see map). The other defibrillator unit is located on the wall of the Methodist Chapel at the eastern end of the Village (see map). In all cases, before you use the unit you must ensure that either yourself or another person dials 999 for ambulance services first. It really is important that professionals are on their way to the patients location. If you do not know the code to access the defibrillator, your local ambulance service will also be able to provide you with the relevant code to open the specific defibrillator cabinet. This needs to be entered using the keypad on the front of the cabinet. Once opened, you will be able to remove the defibrillator unit and, if you are willing, they will ask you to get this unit to the patient and commence the relevant actions yourself calmly, but as quickly as possible. A number of Tresillian villagers who know the codes are also trained in CPR as well as use of the defibrillator units. 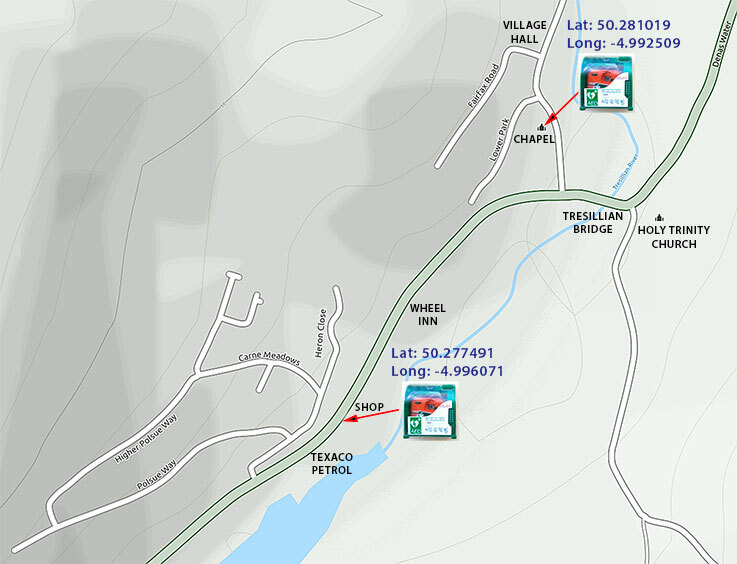 Additionally, the access codes are known by Mary’s Pasty shop, the village petrol station and Graham & Kay Ellis. Remember! Always dial 999 for ambulance services first! This is vital so that professional medical personnel can respond to an emergency and make their way as soon as possible to the patient’s location.